It is a magical fairyland of adventure, with extensive grounds that meander and twist their way around the largest greenhouse I've ever seen in my life. Rooms spilled out from every angle and in each a new living plant to discover and another world to explore. We sweat our way up a stunning spiral staircase to lookout over the tropical trees and bushes, and wipe steam filled windows clean to look out over the grounds. To say I was giddy would be an understatement. On the clearest blue day in Copenhagen we took a step back in time and played children again in Tivoli Gardens. We didn't do much research on Copenhagen before arriving, but one thing that immediately caught our eye was this city-centre treat. One of the oldest amusement parks in the world, it's home of a menagerie of rides, games, and sensory delights. One of the things I was most excited to see in Tivoli was the live pantomime show. It's the oldest, continually running show in the world and easy see why. Part ballet, part comedy and part traditional pantomime- we were mesmerized. The kids in attendance may have stolen the show in parts though, with their belly-rolling laughter and awestruck amusement. It was unlike anything I've seen before. Tivoli also holds a secret- their delicious exclusive beer and ample green space! We spent a good hour just laying in the grass, sipping our lagers and enjoy the sweet sunshine. We stayed until well past sunset and made our way slowly, dizzily back to our apartment. Our heads full of cotton candy dreams, laughter, and happy memories. Add this to the list of must-see when you make it Copenhagen. - b.
Café lillebror - One of the best meals of my life...no, probably the best. By day this simple café serves good coffee and amazing bread, and by night it is transformed into an amazing nordic farm-to-table restaurant. The head chefs were formerly part of the world-renowned team at Noma and have since left to make their own mark on the city. They own a higher-end restaurant, Brør, just steps from the café. The result is fresh, sustainable cooking at an approachable price point. It didn't break the bank but it did break hearts because we only managed to eat there once. The menu changes regularly, but they do accommodate food restrictions. Mikkeller- A world-class gypsy brewer, Mikkeller has built his empire with bohemian gusto and a knack for wild fermentation. Hailing from Copenhagen, he's set down some roots in the city with 2 bars, a bottle shop, and 2 restaurants spread between the hottest neighborhoods in the city. We of course made our way to every one and you should too! It's a great way to see the city and enjoy a delicious pint or two of incredible beer. Øl & Brød- Our favorite of Mikkeller's Copenhagen haunts was his avent-garde smørrebrød (open-face sandwiches) restaurant. We ate our fair share of this traditional Danish dish and these were by far the most interesting flavor combos, made with the freshest ingredients. The herbs still had dew on them (I'm sure of it). Ask the waiter to recommend beer for each dish, the pairings made the meal that much more mouth-watering. Restaurant Puk- For the quintessential Danish smørrebrød experience, you can't go wrong with Puk.The pub like ambience alone makes the trip worth it. We had their small platter, which consisted of pickled herring, smoked salmon, pork with cracklings, and assorted Danish cheeses with all the fixings, and it was more than enough to fill us both up. They also serve a special beer that is locally brewed especially for them. It was simple and refreshing. My uncle recommended this spot to us and he was spot on- thanks Uncle John! Paté Paté- Delicious small plates that take your mouth around the world in a single meal. The food is influenced by so many different cuisines it's hard to pin point an exact influence, but I think I read they're mediterranean sort of. It's best to share, and with so many amazing options to choose from, why wouldn't you? Known for their extensive wine list, we opted for cocktails instead. We're not much for the vino ourselves. A friend from work recommended this spot and now it gets my recommendation too. Deb Økologiske Pølsemand (aka DØP)- Not your average hotdog stand, DØP is 100% organic and topped with the most delectable condiment combinations you'll find anywhere. From pork to goat to chicken, as long as you eat some kind of meat they have a dog for you. I was partial to the homemade pickles and onion straws myself. They're situated right next to the Ründetaarn, a must see anyway, so grab a link and sit on the nearby benches to enjoy. Torvehallerne- Gourmet food market heaven. With two indoor sections, and thriving outdoor produce stalls this sprawling city farmers market has absolutely everything you could want or need from the furthest reaches of Denmark. After sipping lattes from Coffee Collective and eating freshly baked Danish pastries for breakfast, we went back for bàhn mi at lunch. Oh and do pick up something fresh like strawberries or radishes for later, you'll regret it otherwise. Coffee Collective- Infamous in Copenhagen, this minimalistic coffee shop was a friendly spot to pop into at both their namesake cafe in the Nørrebro neighborhood and their kiosk in Torvehallerne. Ryan got deep into conversation with one of the baristas about some espresso we tried, it went way over my head but the conclusion was that Ryan loved it. Den Plettede Gris - Situated at the entrance to Paper Island, a hipster lunch hotspot famous for it's Copenhagen Street Food hall, this hole-in-wall coffee shop is the perfect place to grab a cuppa joe in the morning. The staff was beyond sweet and they didn't bat an eyelash as we butchered the Danish language in an attempt to look cool and culturally adept. The coffee was delicious too. I think that about sums up our culinary experiences in Copenhagen. 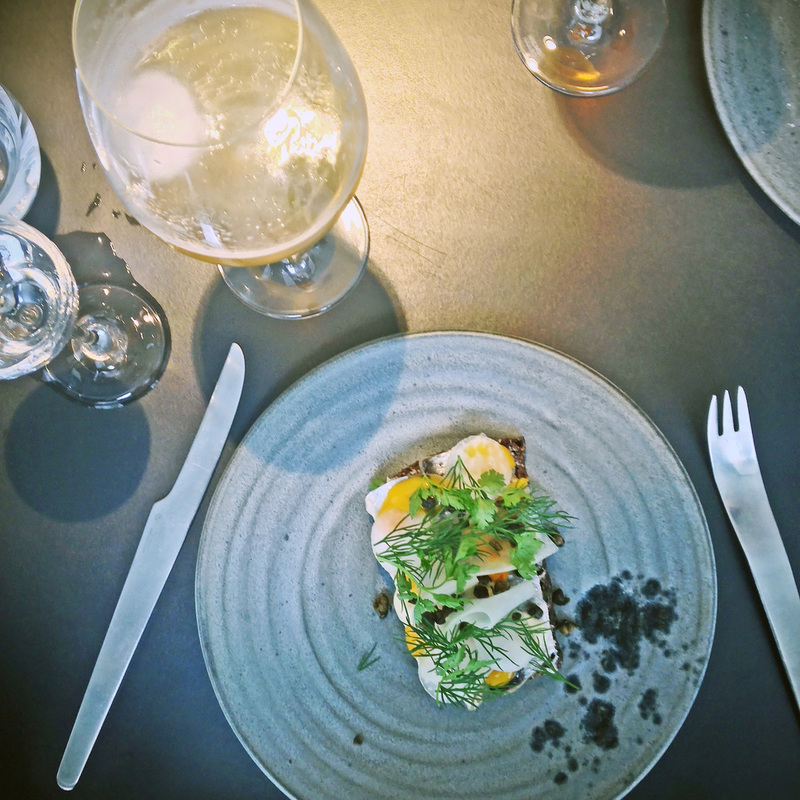 Who knew Danish cuisine was so modern? If you go and try any of our recommendations I'd love to hear what you think! There were so many places we heard were out-of-this-world but never made it to so I'd love to hear of other spots to try next time. There will be a next time. - b.